American River College Women’s basketball team prevailed 51-48 over visiting Modesto, with ARC forward Cassandra Jaimes leading the way with 16 points and 14 rebounds. ARC’s late game free throw shooting and Modesto missing a desperate 3-point attempt in the final seconds allowed ARC to hold on to victory. “By letting us run out the clock, they kind of hurt their own chances,”said ARC’s Head Coach J.R. Matsunami on the offensive struggles that resulted in 3 consecutive shot clock violations. With 7.5 seconds to play, Modesto forward Brianna McGiness made the go ahead bucket to pull Modesto within 3 on the prior possession, was given the opportunity to send the game into overtime but ultimately fell short. 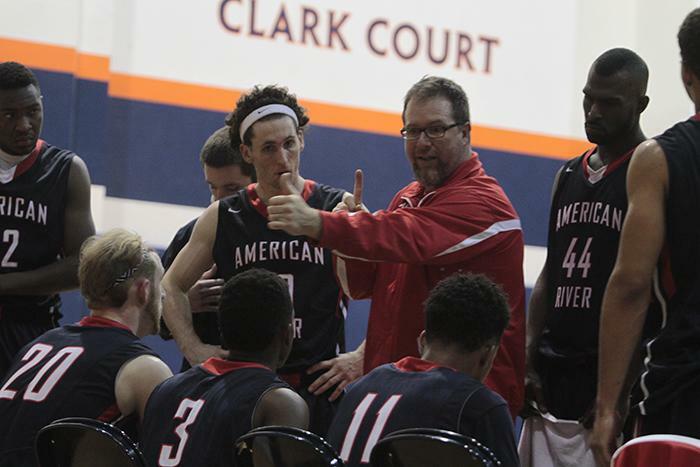 American River College improved to 10-13 overall on the year with only its second win at home this season. Modesto fell to 3-19 overall and lost its fifth straight game in a row. “If other teams play to our tempo, we’re more successful”, said Matsunami. The tempo Matsunami mentioned swung in ARC’s favor when Modesto forward Kaitlin Gundlach went down with an ankle injury with minutes left in the first half. Followed by back to back steals by ARC, Modesto relinquished the lead by the four minute mark in the first half. “It just kinda happens, momentum works in both directions,” said ARC guard Jazlynne Macklin on how her defense changed the complexion of the game before half. Although the score was tied 23-23 by the start of second half, ARC came out as the aggressors drawing three fouls within the first three minutes of the half, two of them being 3-point play opportunities. Of Cassandra Jaimes’ 14 total rebounds, 8 were grabbed on the offensive glass.To go along with her 12 points, Jazlynne Macklin added 5 steals to prevent Modesto from making a run. “Positioning and talking more often to my teammates,” said Macklin about having continued success on the defensive end. Be the first to comment on "Forward Cassandra Jaimes’ 16 points leads ARC over Modesto"